We are very excited to announce this first for Folk in the Barn, Canterbury. We are thrilled to be promoting a date for the long awaited return of Flook. Though their first release, Flook! Live! 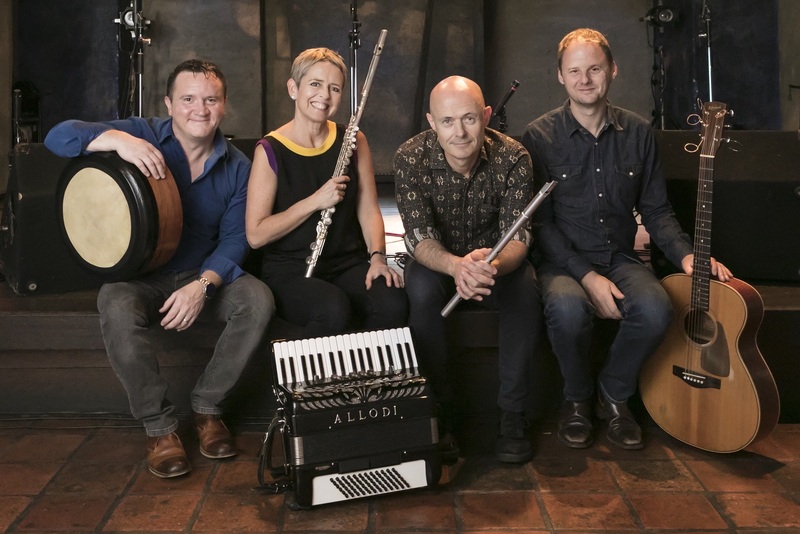 (1997), was already heralded as "the ultimate modern flute album" by The Irish Times, Flook only properly burst onto the international music scene with the release of their debut studio album, “Flatfish”, in 1999. This album introduced master bodhran player John Joe Kelly to Flook's line up of flutists Brian Finnegan and Sarah Allen and guitarist Ed Boyd. Flatfish was hailed as "stunning", "remarkable" and "little short of miraculous", but it was Flook's live performances that really captured the hearts of those who watched and listened; the rapport between these four musicians, the sheer enjoyment they developed in playing together, was commented on by audiences and critics alike. "Rubai", released in 2002 and nominated for BBC Folk Album of the Year, was universally applauded by both journalists and fellow musicians and cemented Flook's reputation as one of the most exciting and innovative bands to emerge from the English/Irish folk scene, and they went on to win the coveted award for Best Group at BBC Folk Awards 2006.